Buy Links: Episodes are available in text and audio and can be enjoyed through the Serial Box App, at SerialBox.com, or wherever eBooks are sold. Blurb Description:You live. You love. You Die. Now RUN. 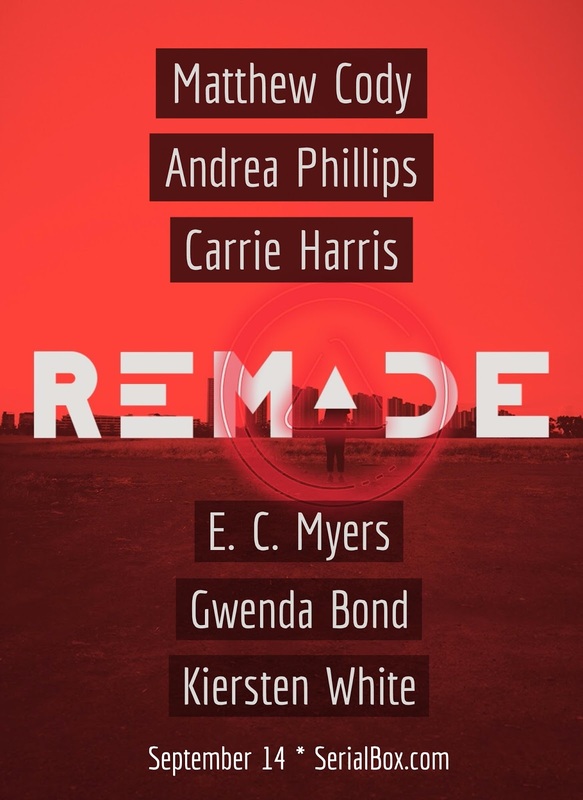 ReMade is a thrilling sci-fi adventure that will take readers past the boundaries of time, space, and even death. This is the 7th episode of ReMade, a 15-episode serial from Serial Box Publishing. This episode was written by Carrie Harris. Converging on the mysterious train, the survivors make their hasty getaway after the horrific caretaker attack and greet new faces while counting those lost. But with a wild landscape streaming past and no idea where they are headed, the question quickly becomes: who is driving? ReMade Season One: In one moment the lives of twenty-three teenagers are forever changed, and it’s not just because they all happen to die. “ReMade” in a world they barely recognize – one with robots, space elevators, and unchecked jungle – they must work together to survive. They came from different places, backgrounds, and families, and now they might be the last people on earth. Lost meets The Maze Runner in exciting serial adventure. Season One will unfold across 15 episodes beginning September 14th, with a new installment dropping every Wednesday until the season finale on December 21st. 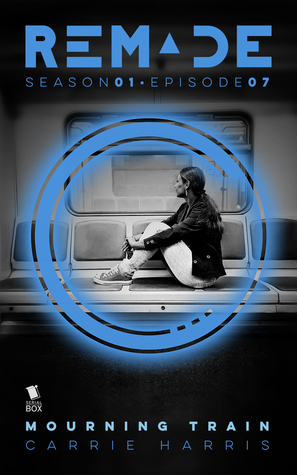 Jump into this digital serial, available in both text and audio, and find out what the future of fiction holds. Before you start this review, you should download you FREE copy of Book One in this AWESOME season here. Or, you can read my review of Episode 1, Shadows and Dreams, written by Matthew Cody here, Episode two, Hungry by Andrea Philips here, Episode Three, Home, Perilious Home here, Episode 4, The Most Dangerous Game here Episode 5, Umta here, and Episode 6, Reality No-Show here. I absolutely loved the connection Episode 6 gave us, connecting Teddy the reality TV star with a possible mental illness to all the space station survivors, and I was so excited to see what everyone would be doing in Mourning Train. It was also told in Nevaeh's viewpoint, and since I LOVED her the last time, I was EVEN MORE excited as soon as I started reading. And, after ALL THE HYPE in my own head, Mourning Train fell completely flat, felt EXACTLY like a filler episode after two explosive ones and had me flipping pages WAITING/ PRAYING/ HOPING for something to happen, but nothing did. Not even a minute after Episode 6 closed, the viewpoint switches to Nevaeh, and the aftermath of the massacre through her eyes. She feels slightly useless, and thinks of all the people that didn't make it onto the train who could've been more useful than her. The episode is spent with a MAGICAL Food dispensing machine and opening a door with Loki's gun to see a caretaker, pining after Holden and bouts of self-pity and flashbacks. While this wasn't everything it could have been, or everything I expected it to be, I will still be following ReMade (I NEED ANSWERS. WHAT IN THE WORLD IS GOING ON?) and it's also understandable to have a filler episode in the midst of SO MUCH DRAMA. 3 stars, and I'm signing off with the hopes of better things coming. 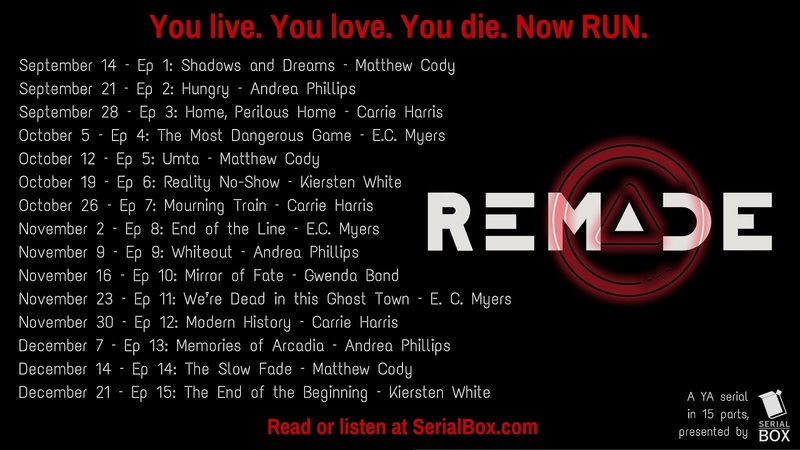 ReMade is a serial presented episodically in 15 parts by Serial Box Publishing. In one moment the lives of twenty-three teenagers are forever changed, and it’s not just because they all happen to die. Remade in a world they barely recognize – one with robots, space elevators, and unchecked jungle – they must work together to solve the mystery and stay alive. They came from different places, backgrounds, and families, and now they are our only hope. Lost meets The Maze Runner in this thrilling serial that combines contemporary YA with classic Science Fiction to fling you headfirst into adventure. Carrie Harris was born in Chicago but if you ask her, she’ll say she’s from Ohio. Her interests include English Literature, brains, and hot geek boys. She has held a string of very incongruous jobs but in between autopsies and studying mad cows, she wrote for various tabletop roleplaying games and textbook companies. 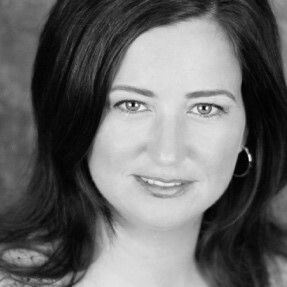 These days she writes books for teens, tweens, and adults while also being the Marketing Director for Evil Hat Productions. Her published works include Bad Taste in Boys, and Demon Derby. CarrieHarrisBooks.com. @CarrHarr. 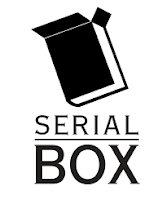 Serial Box produces and publishes fiction serials, blending story production and distribution practices from television, book publishing and narrative podcasting. These team-written original serials span a range of genres including sci fi / fantasy, espionage, contemporary and historical drama, post-apocalyptic, etc. Serial Box delivers episodes to fans’ digital devices every Wednesday over the course of 13-16 week seasons. Each episode is available in ebook and audio and takes about 40 minutes to enjoy. Learn more at Serial Box.com. Follow us on Twitter, Instagram, Facebook, and our blog. Have you heard of Serial Box Publishing? What do you think of Episode Books, and would you read them? What do you think of ReMade so far?